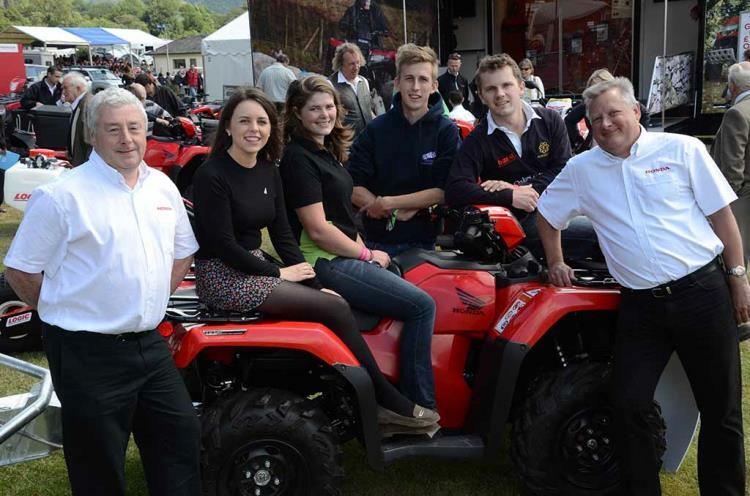 NFYFC has received a huge boost to its farm safety initiative, thanks to a new partnership with Honda (UK), which was announced at the Royal Welsh Show in Builth Wells. Central to Honda’s sponsorship of the NFYFC will be helping to promote All Terrain Vehicle (ATV) safety to the Federation’s 25,000 members. 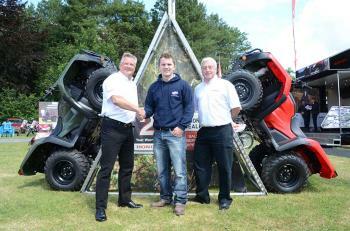 Honda is the world’s leading ATV manufacturer and will become the Federations’ recognised expert in ATV safety. A key role for Honda within the partnership will be championing ATV safety with Young Farmers, by connecting local approved Honda dealers with Young Farmers’ Clubs across England and Wales. 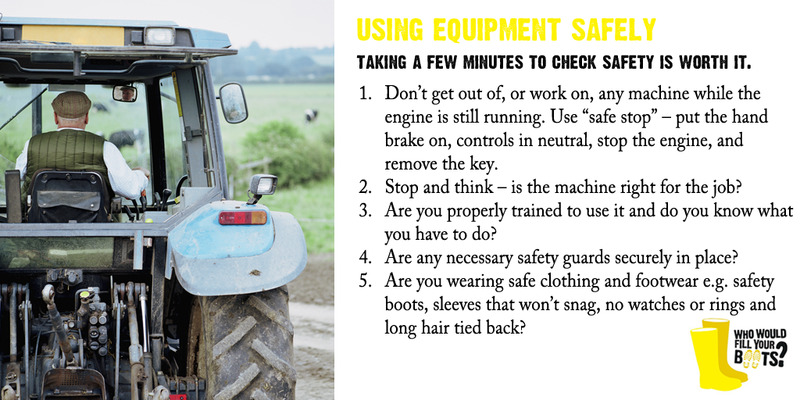 Vehicle safety on the farm is a huge concern for the NFYFC. According to statistics released by the Health & Safety Executive, the largest number of worker deaths in agriculture is caused by moving vehicles, accounting for nearly a fifth of fatalities over the last five years. The NFYFC’s partnership with Honda is part of its nationwide initiative to try to raise the awareness of farm safety to Young Farmers and encourage YFC members to change their attitudes. NFYFC is keen to identify external organisations that can help deliver the farm safety message to YFC members. The objective is to reduce the number of fatal and serious injury accidents occurring to Young Farmers and their families. NFYFC would like to achieve this through the promotion of safety awareness, practical advice and training. Steve Morris, Head of Power Products for Honda (UK) said: “We are delighted to be supporting the National Federation of Young Farmers’ Clubs with a key focus on highlighting ATV safety to its members throughout the UK. “Honda has always been committed to promoting safe and responsible handling of ATVs and we will work very closely with the NFYFC and its members to raise awareness of the importance of vehicle safety on the farm. 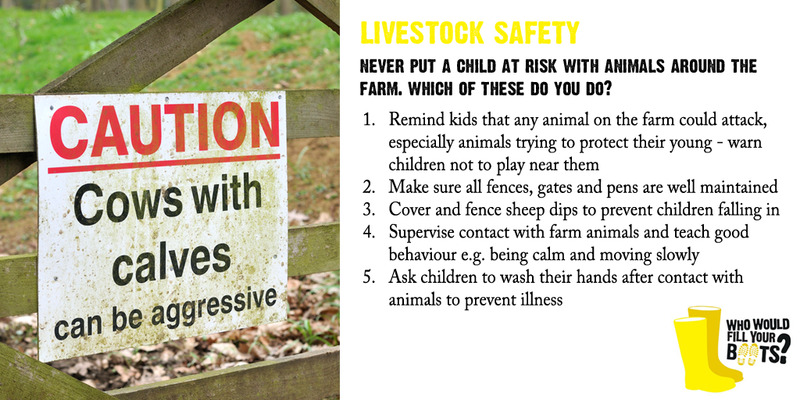 For further information about the NFYFC’s farm safety initiative, please visit www.nfyfc.org.uk/farmsafety. Farm Safety Week 2015 - Farming – it’s not child’s play! Today marks the final day of Farm Safety Week 2015 supported by the NFYFC and the Farm Safety Foundation and today reminds us that farming is not child’s play! 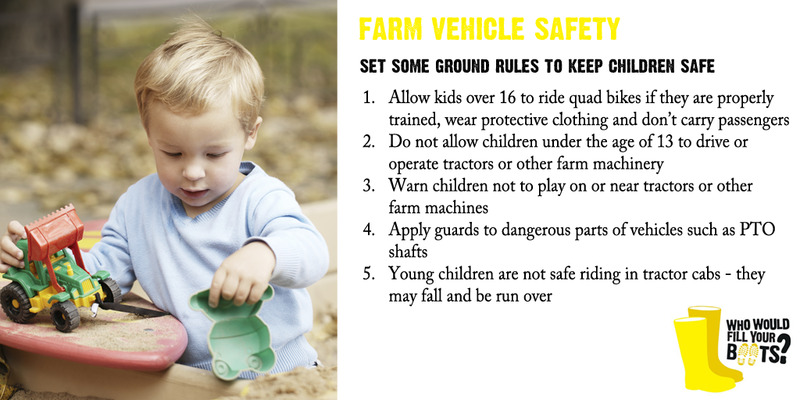 According to Rob Jones, Farm Safety Foundation Trustee: “Every child loves being on the farm, but while it can be place of great fun and excitement, it can also be an extremely dangerous environment – especially for children. As a parent of two young children it is upsetting to read that sixteen children have lost their lives on England’s farms over the past decade. Farms remain the only workplace where children still continue to die in what is always a horrific tragedy for families and heart-breaking for their communities. 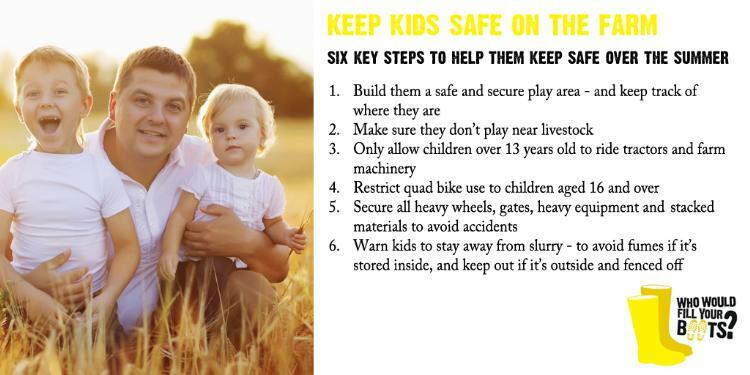 This is why it is important that the issue of farm safety is addressed, a plan is devised and implemented properly. “Summer is a time when children can be more at risk with the long school summer holidays and the challenging workloads for farmers. 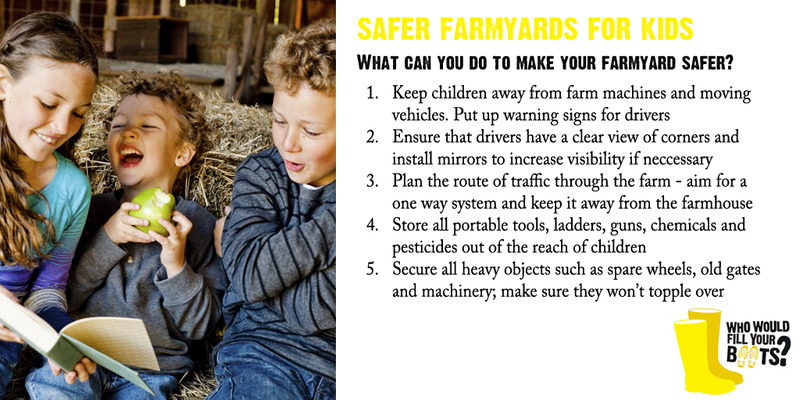 We are encouraging farming families to have a dedicated safe play area for younger children so as to keep them safe from heavy machinery and other dangers around the farm, particularly when farms are at their busiest. Too often, children have access to the entire farm and view it as one big play space. 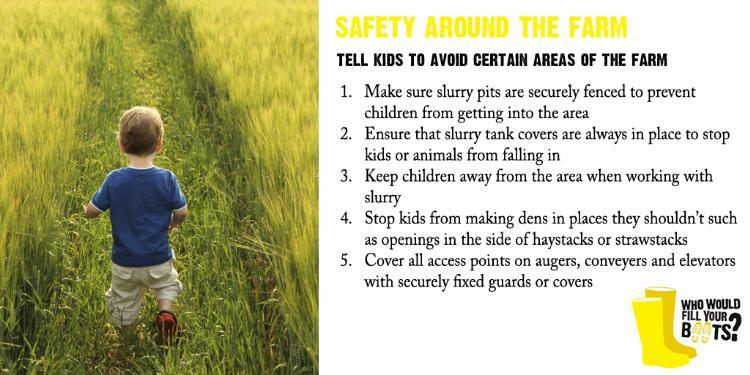 Children must be taught about farm dangers and be kept isolated from these risks. The third annual Farm Safety Week from 6-10 July offers five days of themed practical advice and guidance for farmers, supported by the NFYFC and Farm Safety Foundation. 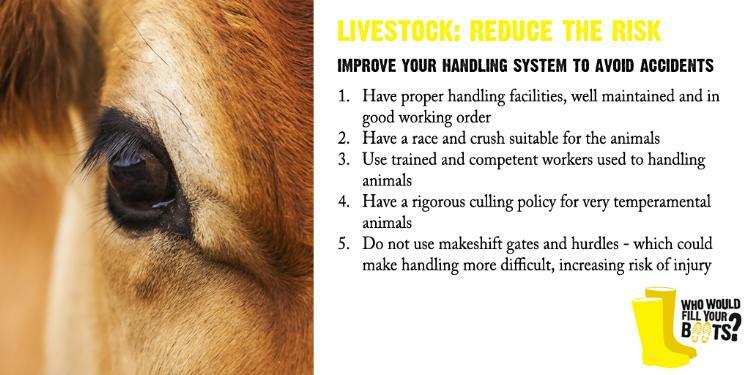 Against the background of the annual Livestock event at Birmingham’s NEC, day four of Farm Safety Week throws the spotlight on livestock and, in particular, crush injuries. Handling cattle always involves a risk of injury, so today it is time to think about how you can improve your livestock handling system and make it safer and more efficient. The accident also had a serious implications for the rest of the family and with Rog committed to nursing his recuperating wife, the farm was not financially viable and a difficult decision was made to give it up eight years ago. Farm Safety Week 2015 – Work Smart, Ride Safe! Today members of Farm Safety Week UK & Ireland gathered at the Livestock Event NEC, Birmingham to celebrate day three of Farm Safety Week 2015. Minette Batters of NFU joined colleagues from the Farm Safety Foundation and NFYFC to highlight the issues surrounding transport and how to prevent transport related accidents on the farm. “Only the previous week I’d got myself a mobile phone, and that was the life saver, really,” says Roger. Despite his stunned state he managed to dial 999 for help, and also to ring his wife and son. His family members quickly located him, closely followed by a paramedic team in a first-response vehicle. The paramedics quickly assessed the situation and called for an air ambulance. In a commendably short time Roger was airlifted to hospital. 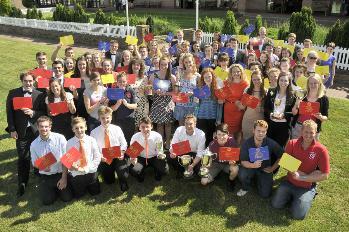 Cumbria FYFC continued to rule the roost at national competitions, as it took home numerous awards at the NFYFC Competitions Weekend in Staffordshire. 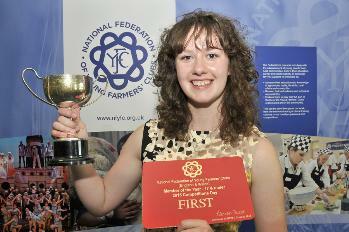 Cumbria collected five top awards, including the prestigious Junior Member of the Year award, which was won by Alice Longmire of Lowick YFC (pictured right). Alice fought off competition from six other finalists, having impressed the judges with her answers about what being a Young Farmer means to her and how to bring in new members. Alice, 18 and vice chairman of Cumbria's Youth Forum, couldn’t hide her disbelief. “I’m still in shock” she said. “I can’t really believe it! I don’t think it’s really sunk in yet! My parents were members and won competitions at county level but never at national level, so I’m really proud. 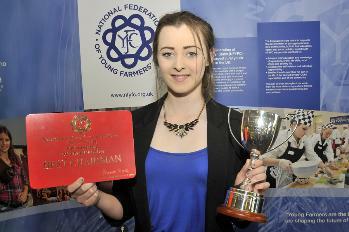 There was even more reason to celebrate for Lowick YFC on Saturday, as another one of its members, Leah Clough (pictured right), won the Best Chairman award in the Junior Speaking competition. Cumbria came second in that team competition, but took first place in the Junior Reading competition. They also came third in the Fashion Make & Model competition and 2nd in the Cube Exhibit. Devon FYFC also enjoyed a very successful competitions day, winning first place in the After Dinner Speaking competition. Daniel Grist of Cheriton & Tedburn YFC took home the Best Speaker award, while fellow club member Louise Putt won the best Vote of Thanks award in the Junior Speaking competition. Devon finished third in that event. Alice had little time to celebrate her achievement as she was competing for Cumbria again in the Dodgeball competition at the National Sports Day at Weston Road Academy on Sunday. But it was Shropshire who dominated that particular event, with both of the county's teams reaching the final. 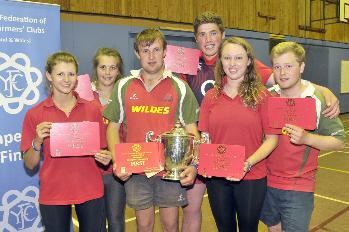 Dorrington YFC (pictured below) won a pulsating final against Whittington & Oswestry YFC to take home the trophy. However, Cumbria dominated once again by taking home two more 1st places, as Richard Lawrence, Kent Estuary YFC, and Heidi Dent, Pennine YFC, came first in their respective senior cross country competitions. Devon too enjoyed further success at Sports Day, coming first in the team cross country competition, while Jordan Ford of Witheridge YFC came first in the intermediate male cross country competition. Yorkshire came out on top in the Kwik Cricket competition, beating Wiltshire YFC in the final. A full list of results from Competitions Day and Sports Day can be found by visiting our Competitions Results page. Head over to our Facebook page for all of the best photos from the weekend. Farm Safety Week 2015 – Take chances with machinery? Not on your life! Do not learn farm safety by accident – this is the theme of the third annual Farm Safety Week supported by NFYFC and the Farm Safety Foundation. From falls and transport to child safety – Farm Safety Week takes place from 6-10 July and offers five days of themed practical advice and guidance for farmers and coincides with the Livestock Event at Birmingham NEC. After losing his foot in a harvesting accident, self employed farmer Dave Allen of Cornwall is keen to highlight the harsh reality of learning safety by accident. A third generation farmer, Dave shared his story which began in 2008 a poor year for harvesting. Wet weather had restricted work but finally the climate had changed and now that it was drier and brighter, Dave was able to resume harvesting the wheat down in Cornwall. On this occasion Dave was working alone when a little of the grain got stuck in the tank of the combine harvester, and Dave did what he, his father, grandfather and others had done for the last 30 years and got into the tank to release it by kicking it to make it move. However, Dave’s decision to rectify the situation as quickly as possible would lead to horrific consequences. Dave explained what happened next: "Rather than using the ladder to enter the tank, which would then stop all the mechanisms, I decided to go in over the top – which meant the mechanisms were still fully operational." "The machinery got hold of my boot so I tried to pull my foot out of it. I managed to release my leg but realised that something was seriously wrong. I was wearing a boiler suit and couldn’t see the bottom of my leg – but I knew from the weight that my foot was gone. I also knew that it was only a matter of moments before my boiler suit was going to get caught and then that would be it. I knew I had to get out of the grain tank or I wasn’t going to survive," he recalls. Fully conscious, Dave managed to haul himself out of the tank onto the cab roof of the combine harvester, climbed down into the cab where his phone was and rang the contractor he was working for to get him an ambulance. "I have been so lucky. I’ve had a good support system around me and the contractor I was working for continued paying me so there was no hardship financially. Not everyone is that blessed. It was five months before I was able to return to work and life could have been much worse than it turned out to be." "I’d never broken a bone in my body before that day," he says, "Everybody in farming knows somebody who has been injured or killed in an accident. My advice to others is quite simple: do not do what I did. Just really think and realise that these safety devices are there for a reason and do not over-ride them. One day it could be you. Don’t think it only happens to others. I’m proof that isn’t the case." 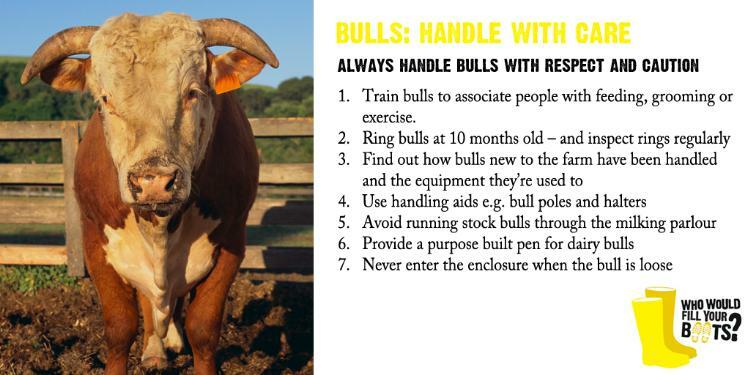 James added: “This Farm Safety Week we are echoing Dave’s call not to learn safety by accident. PTO shafts are dangerous and can rip off a limb or kill in seconds. 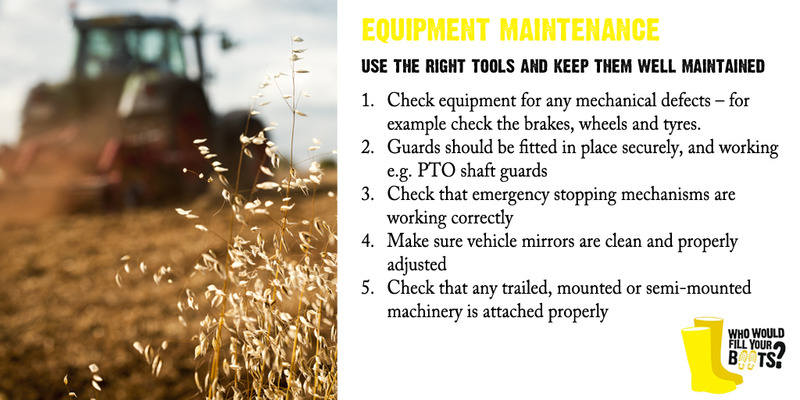 Make sure they are fitted with proper guards that are correctly used and maintained. A properly guarded PTO shaft prevents life changing injuries and even death. Always take your time to think about what you are doing and what might go wrong as making a few simple checks could actually save a life – maybe your own!